Microsoft surprised everyone today with the announcement that the next version of Windows is called Windows 10, not Windows 9 as most had thought. And the answer, given during the Q&A portion of Microsoft's Windows 10 announcement, is a resounding "yes." That doesn't make it quite definitive that Microsoft won't choose something like "Windows Phone 10" or "Windows 10 for phones" down the road, but it certainly makes it seem more likely that they'll drop the "phone" and just called the OS "Windows 10" across all devices. 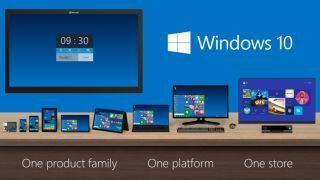 Microsoft wants Windows 10 to cover a huge range of devices and be the only operating system its users need. "Our new Windows must be built from the group up for a mobile-first cloud-first world," Microsoft Executive Vice President of Operating Systems Terry Myerson said during the Windows 10 reveal. Microsoft may have forgotten how to count, but at least its message with Windows 10 is clear.